to portray, but to evoke. Time… the creation of a bronze sculpture takes an immense amount of time, skill and dedication. It is not an endeavor to be undertaken without a great deal of care, commitment and, yes, love. You have to love what you do to spend so much focused time in the process. Here are sculpture by two artists whose work I recently saw. They are both interpreting the same subject and using the same medium: horses, cast in bronze. Both of these world renowned artists evoke the spirit of the horse uniquely and beautifully. 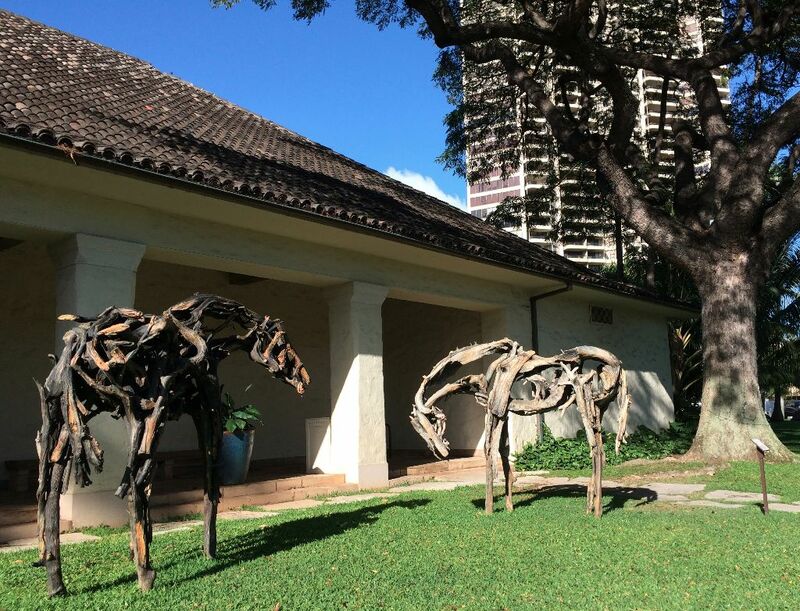 Deborah Butterfield’s equine sculpture is currently on the lawn of the Honolulu Museum of Art. She begins with driftwood, painstaking constructing the figure, which is then cast with astonishing exactitude and treated with delicate patinas. The final sculpture resembles the driftwood so precisely that it takes very close examination to be sure that it isn’t actually made of wood. And yet, somehow the pile of sticks evokes the gentle power of grazing horses. Kevin Box’s work, also bronze, is completely different. His lifesize herd of Painted Ponies gallop across the grasslands with graceful urgency. These photos are from his studio on the Turquoise Trail, south of Santa Fe, NM. 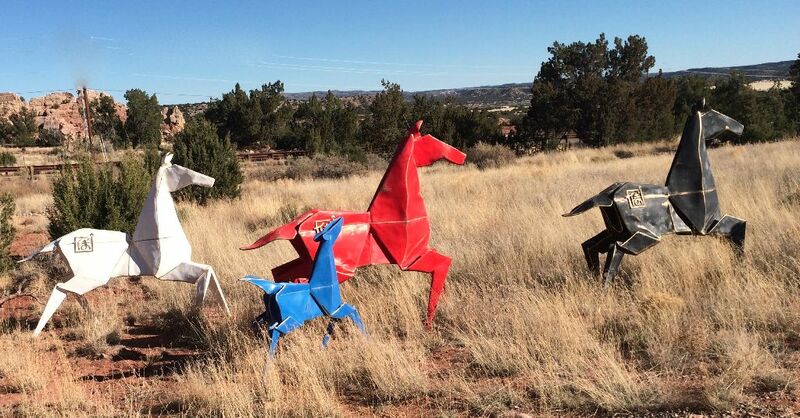 Created in the static tradition of origami, these ponies evoke energy, grace, elegance and movement. I also found Box & Lang’s Hero’s Horse to be a fascinating interpretation of equine energy. 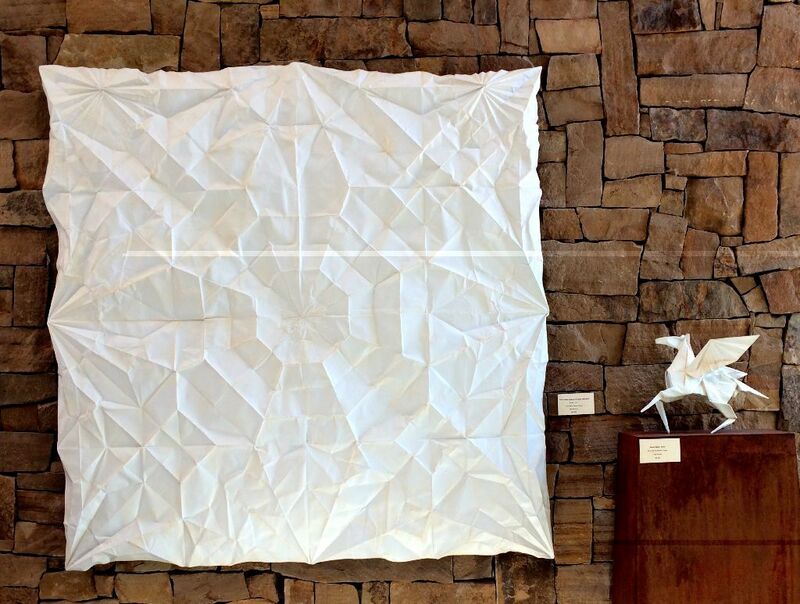 Accompanying the small traditional (though metal) origami horse is a wall piece representing the unfolded origami figure. While the wall piece doesn’t say “horse” to me, it is an interesting and unique geometric portrayal, and quite beautiful unto itself. I find it very interesting to compare these unique interpretations. each artist evoking the spirit of the horse through very different eyes. We saw a bronze driftwood horse sculpture “Higa” by Deborah Butterfield at the Ft Worth Modern Art Museum yesterday. « Santa Fe Studio Tour 2015!